5. 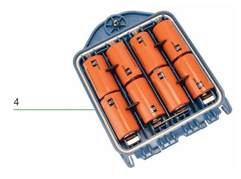 Optional Lithium-Ion rechargeable battery pack. 6. Bluetooth module antenna (Model dependant). 7. Power key : Switches the unit on and off. Opens the transmitter menu. 8. Frequency key : Selects frequency. Menu navigation key. 9. Up and down arrows : Adjusts the output signal level. Scrolls through the menu options. 10. Measure key : Used to take voltage and impedance measurements. Opens a sub menu. 11. Battery icon: Indicates the battery level. 12. Alphanumeric description of selected operation mode. 13. Standby icon: Appears when the transmitter is in Standby Mode. 14. Output level: Displays transmitter output power. 15. 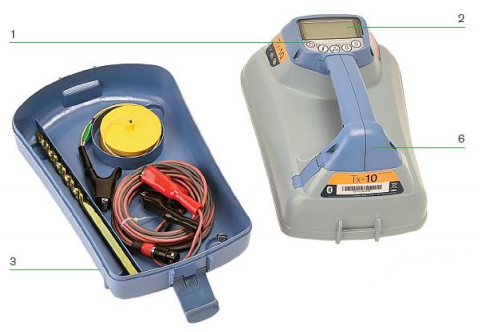 Accessory or Measurement indicators: Indicates if an accessory is connected or if measure mode is active. 16. DC icon: Appears when the transmitter is powered from a DC source. 17. Induction indicator: Appears when the transmitter is in Induction Mode. 18. A-Frame (Tx-5B or Tx-10B only): Indicates when the transmitter is in Fault-Find Mode. 19. CD Mode indicator Tx-10B only. Indicates that the transmitter is in Current Direction Mode. 20. Voltage warning indicator: Indicates that the transmitter is outputting potentially hazardous voltage levels. 21. Volume icon: Displays the volume level. 22. 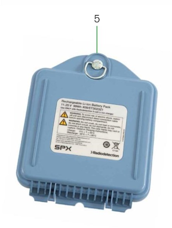 Pairing icon (Tx-5B or Tx-10B only): Appears when the transmitter and locator are connected via iLOC. 23. Bluetooth icon (Bluetooth Tx models): Indicates status of Bluetooth connection. A flashing icon means pairing in progress. Tx-1, Tx-5 and Tx-10 Signal Transmitters.